What a great way to use up overgrown zucchini -- actually, the big guys are the best to use because they have much less water in 'em, and you can get so many cuts of the seedless part. Make more than you think you'll need because you won't believe how much of these you'll want. Preheat oven to 415 degrees. 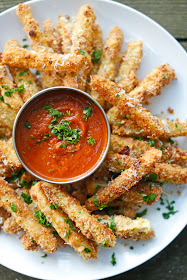 In a large bowl, sprinkle zucchini fries with salt and Italian seasoning. Add in flour and toss to coat. Set aside. Set up two stations, one with egg and whole milk whisked together in bowl and another separate bowl of bread crumbs. Dip each fry in the egg-and-milk mixture and then roll it in the bread crumbs. Place in a single layer on a parchment-lined baking sheet. Repeat until you've used all the zucchini. Drizzle coated fries with olive oil. Bake for 20 minutes. Garnish with parmesan and parsley and dip into tomato sauce.